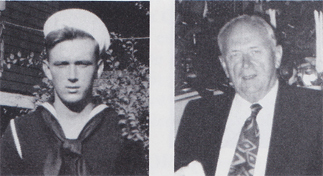 Fred C. Passoth, CPO CSC, born Jan. 3, 1919, Pittsburgh, PA. Enlisted in the USN June 10, 1936, went to boot camp at NTC Newport, RI, and served aboard the USS West Virginia, October 1936-February 1941. Transferred to New Mexico then received orders for shore duty at NAS Alameda, CA. Left Pearl Harbor May 30, 1941, for Alameda NAS; from there, went to Class B, Cooks & Bakers School; Camp Bradford, VA; Hingham, MA for new construction (LST). After commissioning and shakedown, went through canal to Pacific; EOW in Samar, Philippine Islands; being converted to photo relay and communications ship for use during mainland invasion. Also served in LST-942, USS Comet, Mt. McKinley, Nantahala, Electra, Shelton, LST-1122 and NAB Coronado, CA. Returned Stateside in October 1945, transferred to FRA, June 1, 1960, and placed on retired list Oct. 1, 1965. He received all the usual campaign ribbons for 27 months in the Pacific as part of the 7th Fleet (sometimes known as MacArthur's Navy). As a civilian he wound up doing social work for county of Sonoma, CA, until retiring Feb. 14, 1983. Enjoys traveling and goes to PH every year. Married since Jan. 4, 1940, to Catherine Joyce of Long Beach, CA. They have one daughter and one grandson.